Experience a true, exotic Caribbean yacht charter with a vacation in St. Vincent and the Grenadines. Discover a natural beauty and an idyllic tropical paradise that lives up to expectations. Get in touch with our team today and sail the outstanding Tobago Cays and their extensive coral reefs. Explore the magical beauty of the Tobago Cays, an archipelago of five uninhabited cays and reefs where you can spot turtles and colorful fish in waters with high visibility. Relax among palm-fringed, white sandy beaches or swim, snorkel or scuba in the marine park. For kitesurfing head to Clifton, Union, known as the Tahiti of the West Indies. Or you can detour to Palm Island or enjoy a cocktail on Happy Island. Beach lovers need to head to Mayreau’s Salt Whistle Bay or Princess Margaret Beach at Bequia. 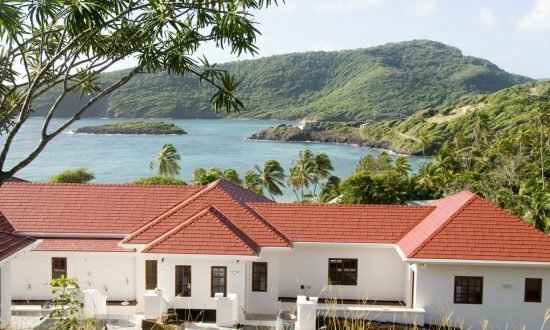 For serious pampering head to the five-star spa on Mustique, while Canouan and Petit St. Vincent have their own distinctive flavor and allure. Wherever you sail, you’ll enjoy an unforgettable Caribbean dream vacation in St. Vincent and the Grenadines. 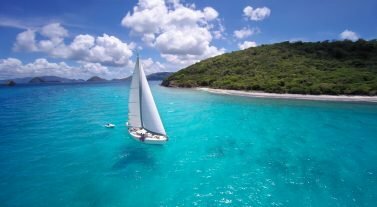 Dream Yacht Charter in St. Vincent: Our diverse fleet of catamarans and monohulls for bareboat yacht charters are in Blue Lagoon Marina on St. Vincent’s southern shore. It’s well equipped with a beach bar, restaurant, dive shop, store, gym and swimming pool. Our St. Vincent base team will receive you warmly and look after you, giving local tips and advice. If you need help planning your charter, check out our inspirational itineraries section or get in touch with our team to find out more. 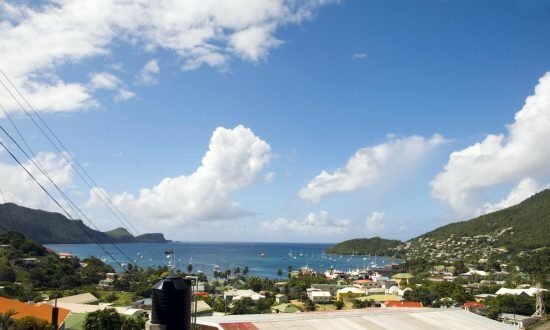 The time difference in St. Vincent and the Grenadines is Coordinated Universal Time (UTC) -4 hours. Make sure your documentation is in order to travel. All foreign nationals, including US citizens, must have a valid passport but US citizens do not need a tourist visa. Talk to us to make sure you have the correct documents before you travel. You can easily hail a taxi in St. Vincent and Bequia but agree on your fare before you get in. For specific information about restrictions, visit the government’s customs and excise website. The currency is the Eastern Caribbean Dollar. All main credit cards are accepted and ATMs are easily found. Banks are open Monday to Thursday (8:00am to 3:00pm) and Friday (8:00am to 5:00pm). You’ll find free Wi-Fi in the Blue Lagoon Marina and at our office. Getting online is easy with plenty of Wi-Fi spots and cyber cafés, but you may find that speeds vary. Temperatures are warm year-round. During the high season between January and May they can reach 81ºF but can still hit the high 70s in the low season. There is more rain May to November and June to August are the wettest months, although the beaches have less rain than the mountainous parts. The sailing conditions include exciting trade winds, which can reach up to 25 knots in the high season. In the low season, you can expect south easterlies between 10 and 20 knots. Swells are around three to five feet in the high season and five to seven feet in the low season. Day 1: Our DYC base at Blue Lagoon Marina, a short ride from the airport, is a perfect location to begin your cruise. A warm welcome and a safe haven awaits you, overlooking the majestic Blue Lagoon Bay. 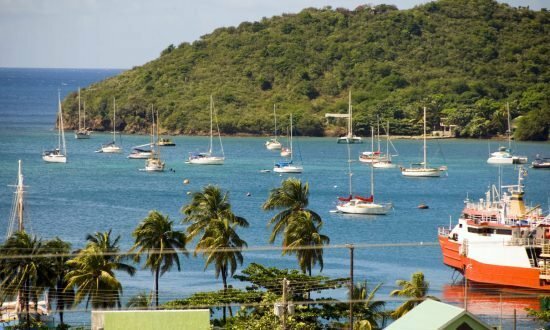 Day 2: Following your morning boat briefing, set sail for beautiful Bequia. Enjoy an eight-mile sail into Admiralty Bay, Port Elizabeth, where the Belmont Walkway runs right along the southern side of the bay. It’s an easy walk and flip-flops are perfect. You can browse the gift shops, restaurants, cafes, bars and a dive shop. Just beyond the walkway is the secluded, clear waters at Princess Margaret Beach, which we highly recommend. Day 3: Get up early for a 25-mile sail (around 3.5 hrs) to the stunning Tobago Cays and its marine park. This cluster of five uninhabited cays offer heavenly lagoons full of green sea turtles, coral reefs, colorful tropical fish and sparkling turquoise waters. It is the region’s idyllic yachting experience. It’s a dream for scuba divers and snorkelers, a paradise for beachcombers and was made famous as the film location for Pirates of the Caribbean. You can close the night with a delicious freshly grilled lobster dinner with a low price of ECD$100 right on the beach with a choice of beverages included. Unforgettable! 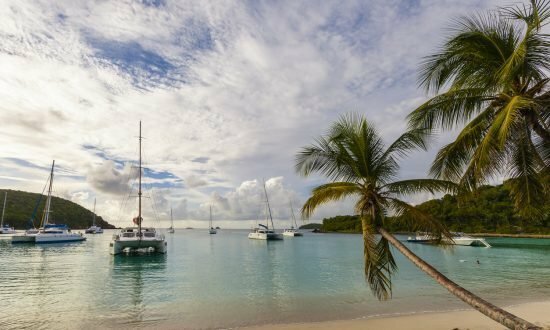 Day 4: After a leisurely breakfast sail seven miles to Union Island, which is surrounded by the beautiful Tobago Cays Marine Park and other stunning islands namely Palm Island and Petit St. Vincent. The island is a top tourist spot thanks to the kitesurfing activity introduced by JT Pro Centre Kitesurfing School on Kite Beach, Clifton. You’ll find plenty of choices for dining here too. 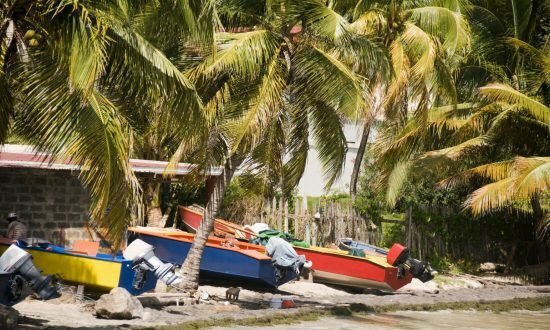 A scoot over to Palm Island is well worth your time and you can also enjoy a “happy hour” drink on Happy Island, which was man-made out of conch shells. Day 5: It’s time to explore fine beaches with a six-mile sail to Mayreau’s Salt Whistle Bay. This is a perfect half-moon beach separating the Atlantic Ocean from the Caribbean side with beautiful white sand, fringed by mature palm trees. With a population of only 200 people in the village, it’s easy to meet the locals, and if you are feeling energetic, you can climb a volcano, snorkel or dive the reefs. As the sun sets, you can enjoy a cocktail from the local beach bar. Day 6: An approximate 19-mile sail to Mustique is on the majority of sailors’ bucket list. It is unquestionably one of the most exclusive islands in the whole Caribbean with 1,400 acres surrounded by nine tempting beaches of pure white sand, gently swaying coconut palm trees and warm, turquoise waters. You can enjoy scuba diving, snorkeling, golfing, tennis, horseback riding, fitness trails and so much more, not to mention a 5-star spa! Enjoy fine or casual dining and keep your eyes open for a few celebrities who are often spotted. Day 7: You can choose to sail back to Blue Lagoon Marina on your sixth day (a total of 15 miles) or leave in the early morning. Please keep in mind that the vessel must be back in the marina the night before 5pm or before 9am as disembarkation is at 10am. We will be here to guide you in and welcome you back! 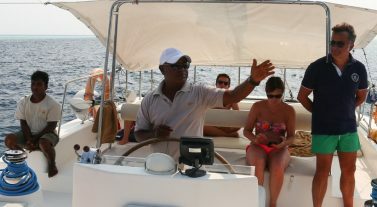 Our St. Vincent and the Grenadines Base Manager will be pleased to welcome you on arrival at the Blue Lagoon Marina. The new Argyle International Airport (AIA) in Kingstown has opened and is expected to take international flights soon. In the meantime, fly direct from the US east coast to Grenada, St. Lucia and Barbados and connect with local Caribbean carriers, such as Liat. We can arrange airport transfers on request to our marina, which takes about 15 minutes. Make sure your passport is in date and valid for the duration of your stay and we’ve got visa advice under our Handy Info section. Monitor the weather and sailing conditions with WeatherCarib. There are plenty of provisioning options, including ordering in advance or visiting the Massey or Sunrise supermarkets, a taxi ride away. In the marina you’ll find a small grocery store, a cafe, bar and restaurant.